Bee There are	4 products. These cards are printed on casino-grade paper for true Aristocat® quality. 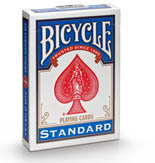 They went through a special finishing process to create a thin, strong, and very springy playing card. A premium-quality playing card. Bee cards are preferred by casinos and industry-professionals alike. A timeless, classic design - masterfully updated. We are now proud to offer the first ever METALLIC deck of Bee® playing cards.